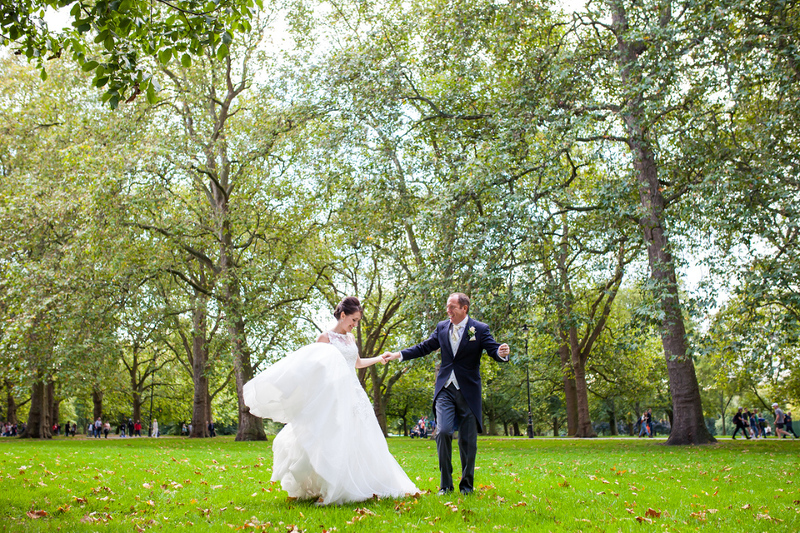 The Dorchester is such an institution it was so exciting to shoot a wedding there. It was a lovely intimate ceremony on the 8th floor of the hotel in the Pavilion room. Most of David’s family travelling from Manchester and some of Annushka’s family travelling from Russia. Poor David’s stress levels were tested as Annushka and her parents got stuck in traffic thanks to a rally closing most of central London. She made it though and looked absolutely stunning. David was gorgeously beside himself with his luck when he saw walk down the short aisle of the Pavilion Room. After the very emotional ceremony on the 8th Floor of the Hotel with amazing views over London, guests had champagne on the balcony and David began his speech with a quick tour of the local landmarks. We were then transported over Park Lane to Hyde Park in a Rolls Royce for some natural portrait shots. They then moved back into the Pavilion Room for an amazing dinner. © 2016 Rachel Ulph Photography | Hampshire Wedding Photographer|ProPhoto Photographer Site Design by Northfolk & Co.